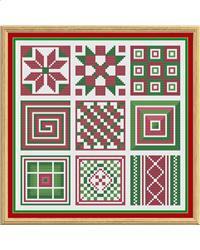 A set of nine easy to stitch Christmas Ornaments in traditional colours. Instructions for assembly included. Patterns are also suitable for making cards. Great for beginners. Project Size: Each Design 2.5" x 2.5"